William “Bro” Adams, the Chairman of the National Endowment for the Humanities, argues that government support for literature, history and languages is critical to our national welfare. While some conservatives argue that NEH funding should be cut, Adams says the humanities are critical for a functioning democracy. As the agency gears up to celebrate its 50th anniversary next year, Adams wants the NEH to do more to address major challenges in society. He plans to launch a new initiative called “The Common Good: The Humanities in the Public Square.” Join Diane for a conversation with Adams about the government’s role in making the humanities more relevant and accessible. William "Bro" Adams Chairman, National Endowment for the Humanities. He is the former president of Colby College and Bucknell University. MS. DIANE REHMThanks for joining us. I'm Diane Rehm. The new chair of the National Endowment For the Humanities, William "Bro" Adams, says his three years of service in the army, including one year in Vietnam, is what motivated him to study and teach in the humanities. As a 20-year-old combat infantry advisor, Adams says he came face to face with the same questions writers, artists and philosophers examine in their work, starting with what does it mean to be human? MS. DIANE REHMNEH chair William "Bro" Adams joins me in the studio. I invite you to be part of the program. Give us a call at 800-433-8850. Send an email to drshow@wamu.org. Follow us on Facebook or send us a tweet. Mr. Chairman, it's good to see you. MR. WILLIAM "BRO" ADAMSThank you, Diane. It's thrilling to be here. I really appreciate it. REHMOh, thank you. First of all, tell me about your nickname. ADAMSMy nickname, which many people have asked about at any age and in Washington and throughout my life, actually, comes originally from my father who came back from World War II and quickly thereafter started his family or continued his family. And I was born shortly after he came back, nine months or so after he came back, and early in my life, for some reason, he was reminded in living with me of a friend of his at Williams College where he had gone and left early to join the army and serve in the army in Europe. ADAMSHis friend's name was Bro at Williams, also left the institution early to go into the army and ultimately to war and was killed in Europe, I think. So there was something about his relationship with me that reminded me of his friend and he started to call me Bro at a very young age and it stuck. And you mentioned my military service. ADAMSWhen I came back from Vietnam and -- excuse me. When I went into the army, originally, my first day in basic training was at Fort Knox, Kentucky. ADAMS...I was with mostly drafted people. And much of the platoon I was in was from downtown Detroit because I was enlisted in the recruitment center at Detroit. And nearly everyone in my platoon was African-American and I was asked the first night, what is your name, and I said, Bro, and I got this very curious look from my bunkmate who was African-American from Detroit. ADAMSSo I went by Bill during my time in the military and I got out and I was in a quandary about what to do with my name and my mother reminded me that it was my father's name for me. He had since passed away. And so in a kind of memory of him and in honor of him, I went back to that nickname and it's been that way ever since. REHMMarvelous story. Tell me about how your service in the military affected your thinking about the humanities. ADAMSWell, deeply and continuously. When I got back from Vietnam, I spent a summer in Ann Arbor in summer school at the University of Michigan. It was 1969. There immense turmoil across the country, including in Ann Arbor, very specifically, mostly about the war. And so I was thrown, as many veterans were, back into the milieu and I went on from there to return to Colorado College, my alma mater, where I encountered, early on, a philosopher there named Glenn Gray. ADAMSAnd Glenn, in addition to being an extraordinary teacher and a huge presence at the college, had written this very important book called "The Warriors: Reflections on Men in Battle." And it was partly a memoir, partly a philosophical reflection informed by his training in philosophy, on his own experiences as an intelligence officer in World War II in Italy and in France. ADAMSAnd he saw some really tough stuff over that period of time. So he wrote this very moving passionate book, but also one deeply informed by his journey as a philosopher and it was an amazing combination of reflection on his personal experiences and the ordeals of that experience, but also incorporating this incredible world of philosophy, some of it classical, some of it contemporary, that he had been exposed to at Columbia and after. ADAMSAnd the book was, to me, completely illuminating and it taught me about how the humanities and how philosophy and that kind of thinking gets at our experience in powerful ways and illuminates that experience and helps us to understand it though the reflection that's offered there. REHMHow do you define the humanities? ADAMSWell, you know, there's a couple of ways of thinking about them. One way that's very common is that we talk about the academic disciplines that are involved in the humanities so we talk about language and literature and philosophy and history and linguistics and art history and all of those kinds of things that are classically in the humanities. ADAMSBut I think a more interesting way to think about them is by way of the things that they are always about. And I think, in one way or another, though, this risks a little simplification. I think they're always about our culture. They're about our history. They're about our ideas and they're about our values. In one way or another, that's what all of those disciplines are speaking about and thinking about and trying to understand. ADAMSAnd that is important to me because those are the places we actually live. We all have a culture, a framework of meaning, in which we live and work. We all have a history, both personal and collective. We all are deeply shaped and influenced by ideas and we all wrestle with the dilemmas and then challenges of sorting out our values and applying those in everyday life and living with those values. REHMAnd yet there are those who say studying the humanities in this time of economic difficulty for the country, especially for young people going through the educational process, worrying about and facing employment, that study of the humanities is no longer relevant. ADAMSAs a former college president, I certainly understand that anxiety and I certainly understand the concern that arises from the particularly stressful economic circumstances we've had recently in this country and around the world, but we're forgetting -- when we go that direction, we're forgetting the people lead whole lives and they're involved as human beings in all part of their lives and all of us need those kinds of understandings and reflections that the humanities afford. ADAMSWe also need them because we are citizens in a democracy and it is the humanities that really speak to us about the things we need to know as citizens in a democracy. Our history, our principles, our values and all of the things that are related to that. REHMYou are the former president of Colby College and Bucknell University. You also, I gather, coordinated the Great Works in Western Culture program at Stanford University and now, what you're trying to do is launch a new program called The Common Good in the Public Square. Tell us about that. ADAMSWhen I came to the Endowment, I was already thinking about what kind of emphasis and tone I wanted to give my time there. And as I arrived and thought about the things we were doing, it seemed to me important that the tone and emphasis that I establish be somewhere in the terrain of the public humanities, the interface between the humanities and our public life. ADAMSI think that's important for a couple of reasons. I think we need to demonstrate, particularly in this time and for the reasons that you described, the relevance of the humanities to the way we live now and to the world in which we live and I think providing occasions and connections between the humanities and public life, broadly considered, not just political life, is a very important thing to do. ADAMSSo I've imagined a program called The Common Good, Humanities in the Public Square, which is going to attempt to inspire, encourage, support humanists, humanity scholars, writers, thinkers, to engage broad issues of great significance in our public life. And I think that will help the public understand more vigorously and energetically the meaningfulness of the humanities and why it's important. REHMHow do you think the nature of public discourse in our lives today has affected our thinking about the humanities? ADAMSI call this initiative The Common Good because I wanted to resurrect that hugely important notion in the Republican and Democratic political traditions about the way citizens engage with one another and with the community in seeking something called the common good, something that transcends our local and particular interests, in our self interests and really tries to get at the good of the whole. ADAMSThat concept has become somewhat fugitive in our lives and I think it's important to bring it back and to connect it to these forms of understanding, which, I think, can help illuminate our public lives in ways that will, perhaps, permit us to picture the common good. REHMIs it, in part, the reality of the breakdown of the family, for example, that we may have lost that sense of the common good? ADAMSI think there's several ways in which our collective lives, whether they're in family settings or in broader community settings have been badly fragmented and where we find ourselves either isolated in certain specific ways or we find ourselves unable to think about things that unite us as opposed to divide us. So we're very good right now in America, thinking about the things that divide us and impressing on the things that divide us. We're not very good at thinking about the common good. REHMWilliam "Bro" Adams, he's chair of the National Endowment for the Humanities. We're going to open the phones soon, 800-433-8850. I look forward to speaking with you. REHMWelcome back. My guest is this hour is William "Bro" Adams. He's Chair of the National Endowment for the Humanities. He's former President of Colby College and Bucknell University. And he's here in the studio with me. We'll look forward to hearing your questions, comments. 800-433-8850. You have said that you believe Humanity scholarship has become too specialized. What do you mean by that? ADAMS...and some of those are very specialized fields. And they're very valuable, nonetheless. But I think we've lost a sort of a more common touch and a way in which the Humanities speak, as I've been trying to say, to broader, very concrete issues, that all of us experience as human beings. So, I think we've lost some of the existential quality, if I can put it that way, of the Humanities. 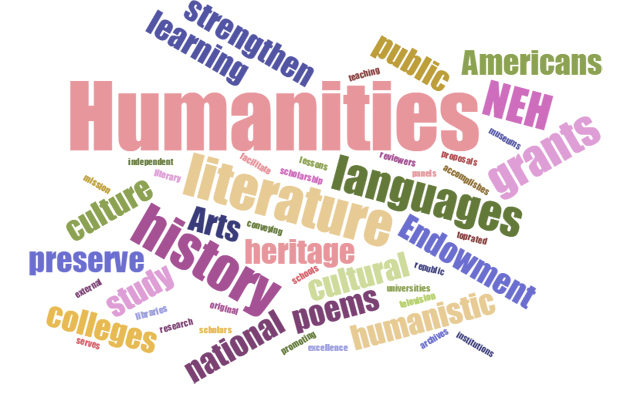 And I think this initiative that I've engaged, and other things the agency is doing, that NEH is doing, are important, in some ways corrective, to that specialization and professionalization. ADAMSI want humanists and Humanities scholars to think about speaking in the public domain about things that matter to all of us, because I think they have a tremendous amount to give. So I'm hoping that we can encourage some of that. REHMTell me why you think the study of Philosophy, which I know you have done, is important. ADAMSWell, I think Philosophy touches the place in which most of us live most of the time. It has to do with our values, about our fundamental ideas, the things that motivate us, the things that we get up in the morning and that take us to work and make us who we are. I think philosophers, or some philosophical traditions, and some philosophers, have a wonderful way of reflecting, analyzing and helping us think about those things. I mentioned my mentor, Glenn Gray, but there are many other examples. ADAMSWilliam James, the great American pragmatist, described Philosophy, in the end, as being primarily about the conduct of life. I love that idea, that all of these things emerge from the language of our experience. And they return in some ways to our experience. And when they come back to that experience, I think we're fortified and we're better off. Last night, I went to a bookstore nearby, Politics and Prose, and I heard the novelist Richard Ford read from his work and talk about questions that were asked of him and he made a very interesting comment in the course of the questions. ADAMSAbout something that the philosopher Jean Paul Sartre had said about novels and about the literature. Always being aimed at our experience, but reflected, our experience is reflected in the novel and reflected in literature, and in that reflection, we understand ourselves better. I think that's true of most of the important work in the Humanities. Not just literature and the novel, but in Philosophy as well. In that reflection, we understand ourselves better. And I think we're stronger and better people because of that. REHMNEH, the National Endowment for the Humanities, as well as the National Endowment for the Arts, are both targets of Congress, wanting to reduce the amount of spending in those two areas. Are you, as part of your role as Chair, speaking with members of Congress about what you see as the importance of continued funding? ADAMSAbsolutely. It's one of my principle obligations and I've already started. I've met with most of the members, or many of the members of our Appropriations Committees on both sides of the House -- in the House and the Senate. What's interesting to me, Diane, is I've found almost to a person, in those conversations, a real sympathy for what we're doing within those Appropriation groups. And a real understanding of what we're doing. The country and the government, the federal government, is under tremendous financial pressure. ADAMSAnd I understand the conversation about the responsible spending of taxpayers' dollars. But what I think is so important is for us to remember the good that these two agencies have done over their now 50 years, nearly 50 years. We're celebrating our anniversaries next year. And the cultural capital that these two agencies have created in 50 years is immense. And it's not just important in the very most elite institutions in the country. It's spread out across communities all over the United States, in every state, in every territory. We have Humanities councils. ADAMSWe're doing fabulous local work in communities. So this cultural capital is vibrant and alive and significant in communities all across the country. And so it's important for me to remind our legislators of that and how much this investment has produced in terms of community good, not just at the very highest level, which we've done. But also in small places across the United States. REHMAnd yet, is it surprising to you that when you speak with them individually, they are sympathetic? They are in agreement, and yet, together, as a whole, there is still that push to reduce the impact of government on the population. ADAMSYou're right that the discussion changes form in a broader, sort of, more abstract setting. And I think what happens there are several things. The thing you referred to about this very intense focus on economically relevant activities. I would argue that, by the way, NEA and NEH have produced a great deal of relevant, economic good across the country, in addition to the cultural good they've produced. Again in these communities where the cultural and artistic economy is very, very important. ADAMSIn Waterville, Maine, where I came from, and Colby College, the cultural and artistic economy was one of the few threads holding this post-industrial town together. And it was very important economically. But apart from that, we can't let the press and the pressure of these immediate financial questions take our eye off this broader question? What do we need with respect to citizens? What do we need with respect to an educated populous? REHMOn the other hand, let me, pardon me, play devil's advocate and simply say, why can't the private sector do this? ADAMSIt's a question that many people ask and I think if you go back and look at the history of this agency, and the NEA as well, you'll see that over that period of time where NEH has invested, by the way, about 4.8 billion dollars in the cultural sector, and we have leveraged in that time about two and a half billion dollars in additional private gifts. Most of the work we do would never be appropriated or made up for by the private sector. ADAMSWell, for example, NEH is very committed to the preservation of cultural materials, all over the country. So, rare artifacts and documents, whether they're manuscripts or other kinds of collections, the private sector is simply not going to make up for the work that we've done over many, many years now in preserving all of these cultural assets. It is no one's charge but ours to pay attention to the national heritage. And so, the heritage of the country and the heritage of the culture is very much our mission and nobody else has that mission. ADAMSNobody else is assigned that task of making sure that we preserve this national legacy. So, I don't believe that the private sector will ever make up for what we do or will do in the future and I think it's naive to suggest (technical) will, because I just don't think it will happen. REHMSo, on the eve of the celebration of your 50th anniversary, do you expect the Congress will fully fund the NEH, the NEA at current levels? ADAMSIt is my deep hope that these arguments, these kinds of arguments, about the meaningfulness of this investment over time and the importance of the continuation of that investment will carry the day. I don't have a crystal ball and I can't see, but I think if I am able, and if my colleagues at NEA were able to demonstrate the importance of that investment over these 50 years, I think we have a much better case. And I think there's a good chance that it will be persuasive. ADAMSAgain, I can't predict the future, but I think there are ways to talk about this investment that are compelling, and I expect to be making that case and my colleagues at NEA will too. REHMI'd love to hear about your relationship with movie actor Morgan Freeman. And how that relationship came to be. ADAMSWell, it came to be, really, through NEH. He was invited to preside at the dinner that we held for our medalists and I met him in that context. We had a very nice connection. I would say that my wife, Lauren, had an even better connection than I did, and she has actually attempted to continue talking to him about things that matter. But, he is clearly somebody who cared about and had connections with the agency before. And he's a fan of NEH. He's been a great supporter of ours. And I was pleased, as Chair, to get to know him and come into his company in that setting. ADAMSYeah. He was great. He was great. REHMHe was just terrific. We've got lots of callers. Let's open the phones now. 800-433-8850. Let's go first to Tom in New York City. Hi there. TOMHi. I was calling to recommend that not only doesn't the private sector care for, but the private sector, in the form of collectors, and developers, are actually actively eating away, in many cases, at our cultural heritage. I'm from Buffalo, and my mother's there right now. And thankfully, she's only got a couple inches of snow. TOMYeah. It hit the south towns mostly. TOMBut in 2007, they -- the Board of Directors of the main art gallery there managed to work with Sothebys to sell off artistic treasures going back to the 13th century B.C. That cultural heritage was sold off for the purpose of buying contemporary art. And there was a Pulitzer Prize winning poet, Carl Dennis, and a group of professors in the Humanities, who tried to prevent that sale and they couldn't. So, I just wanted to recommend and comment that the private sector is often the culprit rather than the savior when it comes to our shared cultural heritage. ADAMS...many of us are aware of the Detroit story, which fortunately, recently, had a very positive resolution, partly because of help from the private sector. But partly because of the creativity of the judge and the court involved. But there is a lot of pressure on these institutions and it is worrisome that some of these things have developed. I go back to our original charge, the charge of NEH. We are uniquely charged with, in our original legislation, with caring about this legacy. ADAMSAnd I think it's terribly important that the federal government and the nation have that commitment front and center and we're the place that is representing it most powerfully. REHMAnd you're listening to "The Diane Rehm Show." Let's go now to Rockford, Illinois. Hi Greg. GREGGood morning. When you mentioned the Humanities, the Humanities, I think of the principle of truth. And particularly with Philosophy because truth is the one thing that makes all values possible, for without truth, we can't really value anything. Nothing has value. And when you think of ethical relativism, a purpose of Humanities is to establish principles and values. And without a firm foundation and a basis of truth and trust, that simply can't exist. Secondly, in terms of the economic onslaught on Humanities and on the principles, the Greeks told us -- taught us, principles, not men. GREGI would only ask the professor this one question. When we're talking about Humanities and values and principles, how can we have a value system unless we cherish it more than money? It's simply impossible. You have to make a choice between principle, P-L-E, and principal, P-A-L. And then thirdly, in terms of the family, the element that maintains the value of the family is the character of a particular individual in that family. So, it is our internal character, I would suggest, that we all have in common, if we will develop it. And I thank you for this opportunity. ADAMSWell, thank you, thank you for the question. The philosophical tradition is, in some sense, a long argument about the nature of truth. But the discussion goes on and of course, philosophers continue to talk about and debate and argue what truth is, how we find it, how we know it when we see it, what difference it makes in our lives. And that conversation must go on and it's a very important one. You mentioned a classical tradition. Here's an interesting anecdote from my recent experience. ADAMSI was in New York City a couple of weeks ago visiting one of our grantees, the Aquila Theater, which is an entity out of New York University, which is in the business, or in the work of providing opportunities for Iraq and Afghanistan veterans to produce and act in Greek tragedies. I went to one of these performances a couple of weeks ago, and I was deeply moved by it. And what I think I saw there was not just the way in which this Humanities text, or these texts that they're working with from that ancient tradition, were meaningful to the veterans involved. ADAMSAnd were giving them resources to think about their own experiences. But what a different insight it gives me and all the people in the audience about what those texts mean. And how we should understand them. So this interplay between the contemporary and the classical, the ancient, between the current and the past, between the classical tradition and our current circumstances, is I think a very important one. And a very rich and interesting one. And in that case, a very moving one. REHMAnd, of course, he talked about money as well, and how money plays out in our culture. ADAMSWell, and you mentioned before, and I think he was referring to this preoccupation right now with things of economic and financial value. And again, I understand the reasons for that. But as we worry about that, we've got to keep mindful of this other enormously important value that the listener and the questioner raises, which is the value of that tradition. REHMWilliam "Bro" Adams, Chair of the National Endowment for the Humanities. Short break. We'll be right back. REHMAnd welcome back. I hope you've been with us for the hour. My guest is the chair of the National Endowment for the Humanities, William "Bro" Adams. And here is an email from Jennifer who says, "my husband and I were very fortunate to receive high quality liberal arts educations. However, given the cost of education these days, we feel it will be almost impossible to give our three children that same advantage. What does your guest think about the cost of liberal arts education?" ADAMSWell, it's not just the cost of liberal arts. It's the cost of university and college education generally, whether it's liberal arts or technical and professional education. And we have a real major issue with respect to the cost of scholation in private and higher education now. I was college president for 20 years. ADAMSI fretted and worried about this a great deal. The cost question is complicated. It's driven, in part, by the competition between and among institutions for audience, for students and for status. And the market has, in some ways, insisted upon some of these escalations because of the things that people are expecting in the college experience. And sooner or later, there is going to be a market shift, I think, in what people value and what they're insisting on and that's when the cost escalation will stop. ADAMSBut irrespective of that, which is a real issue, the liberal arts remain in a costly or in a not so costly situation and institution central to what I believe is the most effective and important approach to higher education. Whether you're doing it in an expensive or a less expensive way, we still have to choose and think about what kind of education we want. And my argument has been, for all that time, and still continues to be that a liberal arts education at the college and university level is the most important and valuable form of education. ADAMSBecause it creates two important things. It creates whole people who are able to engage in all parts and sectors of their lives in very meaningful ways. It also creates people who are much more likely and inclined to be involved as citizens in the democratic world and the country in which we live and I think, finally, that the skills and capacities that the liberal arts educational approach gives to students are undervalued as attributes and skills and values that matter in the market place and that matter at work. ADAMSI'm not sure that that's the most important argument for the liberal arts, but it's clear to me after 20 years and meeting many, many alumni from many different kinds of institutions that those qualities that the liberal arts instills are extremely valuable as professional attributes. REHMOne of our listeners, Hank, wants to know if you have read E. O. Wilson's latest book, "The Meaning of Existence." He says it was a fascinating perspective on the humanities and science and how they complement each other. ADAMSI'm embarrassed to say I have not read it. I'll order it as soon as I get off the air. I love the title. I will comment on the topic, though, because I think it's an important one. Walter Isaacson was the Jefferson lecturer last -- this past season for NEH. That's our annual feature lecturer. And Walter talked in a very meaningful way about the relationship between the kind of thinking that goes on in the arts and humanities and creative scientific and technical innovation. ADAMSAnd, of course, he was thinking about people like Steve Jobs, but he was also thinking about people like Einstein. And he did a wonderful job of demonstrating the ways in which these really important innovators, whether it's in technology or in the fundamental science were informed by and dependent upon those kinds of understandings and abilities and capacities that we see in the humanities and the arts. ADAMSIt's a wonderful lecture. It's available on the NEH website and I'd urge people to look at it. But I think the questioner is right to point out those vital connections because they're real and they matter. REHMAll right. Let's go to (word?) in Harding, Illinois. Hi there, you're on the air. Hi. I'm very excited, even though my English might not be so great. REHMOh, it's just fine. Go right ahead. Yes. I totally and strongly agree with Mr. Bro's way of thinking on the humanities. It is basically a thought on human conditions and common goods and there might -- big disappointment to when I was study many years ago in Virginia, UVA. And I discovered -- I was studying philosophy, but I discovered that philosophy has sadly gone on the way of all the other humanities and it become all very technically (unintelligible) oriented, which is very sad, of course. But here, my main point here, I'd like to talk with Mr. Bro is that -- and I feel he talked about a citizen nowadays not really thinking about a common good. And I would say, you know, citizens who are not aware of a common good are not citizens. So, to me, in my mind, you know, I have been in this country for a quarter of a century. I just feel people in this country are not really citizens. And our basic problem in today's political situation is that because we don’t have a citizens. ADAMSWell, it's an interesting set of related questions. There are reasons, I think, to worry about the nature of political participation in this country and its extent. Not just with respect to voting where most of us concentrate most of the time, but with respect to all forms of engagement in the democratic process beyond voting. There are reasons to worry, I think, about the level and quality of participation in this country. ADAMSAnd part of it does probably have to do, as the listener suggests, with a weakness to this question or this notion of the common good and the things that are at stake in the exercise of citizenship and the things that motivate us in terms of citizenship. So one of the questions that I think humanists should be talking about is what are the opportunities and possibilities for Democratic citizenship in this country now and how can we understand more deeply and more effectively what those opportunities are, what the challenges are to those opportunities, the reasons people are not, perhaps, availing themselves as much as we would like of those opportunities and to really focus on that question. ADAMSI think that's one of the broad public issues that humanists can help us understand in a very meaningful way. REHMAnd to Ben in Durham, North Carolina. Hi there. BENHi, Diane. Thanks for having me on your show. My question for your guest is -- I think you've kind of touched on it a couple of times in various answers, but how have you, throughout your work at different universities and now at kind of in the public sector, how do you go about stimulating public interest and demonstrating the value in humanities and studying the humanities and maybe there's more creative ways that we could go about doing that. ADAMSWell, it's a great question. One of my hopes is that The Common Good, this initiative, will demonstrate the ways in which humanists can speak to issues of common public concern in compelling and powerful ways. We're hoping to do that in a number of different ways at the agency by inviting scholars and humanists in a whole variety of settings and contexts to come into that sphere and to use their knowledge and understanding to work with people on these issues. ADAMSNot because we know the answers. We don't know the answer. But because we know the questions matter and we know that the humanities have things to offer with respect to the pursuit of answers to those questions. So that's the way at the agency right now that I want to be able to reveal the ways in which the humanities can be meaningful and relevant in that public context. But I think in the academic setting, too, I hope that humanists will be more public facing in the future and will take advantage of their knowledge and their sources of knowledge to join that enterprise and to demonstrate the meaningfulness and relevance of the humanities to their students by taking a look at the public sphere. ADAMSI think it has to happen in many more places than NEH. REHMSo what you're talking about is bringing in scholars to the NEH, but what about getting those scholars out into the public sphere talking about the importance of the humanities and the importance of taking time to think. ADAMSYes. Well, that's exactly what we need to do. We're a grant-making agency so we don't really have scholars at NEH, though. All the people that work there are very interested in these questions and some of them have been very productive and still are productive scholars. But what we can do is provide resources to humanists out there in the world to engage these topics and to become spokespeople for the humanities in these various settings. ADAMSAnd that's where NEH has its biggest opportunity, I think. But meanwhile, we need help. We need the help of scholars all over the country to take a more public-facing outward-looking position with respect to their work and to attempt to engage their students in new and more public-facing ways. REHMAnd let's go to Douglas in McClain, Virginia. You're on the air. DOUGLASThanks. Good morning. Mr. Adams, a little while ago, you said that philosophy is where most of us live most of the time and that requires true reflection and give and take and openness. And, you know, in the discussions I've had with people online and in person and ever since reading a book last year called "The Republican Brain," which better would've been titled "The Conservative Brain," I don't think a lot of us live like that. DOUGLASThere are a lot of people out there who are just not open to discussion, to facts, to give and take. They know what's right and if you challenge them with facts, they become -- they totally close up. It's called disconfirmation bias. They don’t want to hear about it. It's the kind of people who, you know, are just totally closed to any kind of evidence that challenges creationism or anything like that. DOUGLASAnd I think that it's very scary and depressing and that's why a lot of these congressmen will say, oh, yes, we really appreciate the humanities to your face because they're very good at manipulating people, but when it comes to the actual vote, they don't agree with you. ADAMSI may not have been clear -- and thank you for the question. What I really meant was, is that philosophy is concerned with the stuff of our experience. Not that we all live in philosophy because I think you're right. We don't live there a lot of the time. But a great deal of what matters in philosophy is about the realm of experience that we inhabit all the time and where reflection can be illuminating so we all have the chance, I think, of becoming more reflective and more thoughtful about our experience in ways that I think philosophers can help us understand. ADAMSSo I completely agree that we don't live there in that lucidity all the time, but I think a good deal of philosophy and the tradition of philosophy seeks to illuminate that place we live all the time. REHMAnd you're listening to "The Diane Rehm Show." Here's an email from George in Ames, Iowa. You talked about the grant making aspect of NEH. He says, "I've served on many NEH grants panels, including media proposals. In programs having political content such as "The Roosevelts," will it always be necessary to have ideologically balanced perspectives? I was a professor of history for 35 years and dedicated myself to working out the best scholarly understanding of the subject. REHMOught not this perspective inform such programs, ideology aside?" ADAMSWell, at NEH, we are required and we attempt, I think pretty consistently and energetically, to avoid strongly biased or strongly ideological work and statements. I understand why somebody might find some pieces of some parts of the work that we support to have points of view, but we're not trying to produce points of view. We're trying to support work that illuminates parts of history, parts of our common lives in other ways in ways that are useful to people and not to advance particular political positions. ADAMSSo we're not trying to produce ideology. We're trying to produce insight and that covers, I think, the work that we do in film, it covers the work that we do in a lot of different things. REHMSo now, how will you go about celebrating the 50th anniversary of NEH? What are the programs that we in the general public can look forward to seeing and hearing about? ADAMSWell, we're going to be communicating a great deal about it in trying to communicate a lot from our own and through our own communications channels about that history and broadening public understanding about the significance of that history. So you should stay tuned for treatments on our website, in Humanities magazine and other things that we control and produce. My interest in this celebration is partly related to the extraordinary moment of the founding. ADAMSAnd I think there's a great opportunity to talk about that amazing period in 1965 when NEA and NEH were founded through congressional legislation and that moment was so interesting, I think it provides an opportunity for some really interesting history that we can tell and share with the American people. REHMAnd I'm sure LBJ was very much a part of that. ADAMSHe was and the LBJ library's very interested in working and is working with us on that celebration. Apart from the things that NEH communicates, we're gonna be having events around the country sponsored, in part, by our state councils. We have state councils in every state and in every territory of the United States and we're gonna seek their help in having events, gatherings, that communicate and connect to communities in very local and close ways. ADAMSLast, but not least, we're gonna be working on a program having to do with the future of the humanities, which I think is of concern to all of us and we're gonna be working with a number of foundations and some other entities to have gatherings, initiatives that help us think about, collectively, the future of the humanities. REHMWell, I wish you all success. REHMWilliam "Bro" Adams, he's chair of the National Endowment for the Humanities, former president of Colby College and Bucknell University. Thanks for listening, all. I'm Diane Rehm.